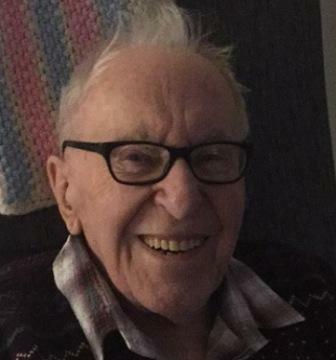 Joseph “John” Olson, age 88. Born in Ontario on December 25 1927 peacefully passed away on Monday October 17th 2016 holding his granddaughters’ hands at Gemstone Care Centre in Kamloops BC, following a lengthy battle with cancer. He leaves behind his wife of 69 years, Jean Olson. His two sons Jim and Terry Olson, his predeceased daughter Lisa Ackland (Olson), his two granddaughters he was a father to from age 5 Sarah and Ashley Ackland, his granddaughters Angela Olson-Murawesky and Jennifer Olson his grandsons Aaron, Cory and Ryan Olson. John was a retired operating engineer for the local 115 IUOE Union. He was very proud of and enjoyed his career for 45 years “building highways on his D9 cat.” John and his wife Jean moved to Kamloops from Ontario to get married and start a family. John worked away from home in camps to provide for his wife and family. He survived many accidents on the road and at work, he would say that he has 9 lives just like a cat. Many people remember John by his love for his wife Jean, his love for cats and his love for rebuilding old lawn mowers and washing machines. John was a very gentle and compassionate man. He loved thrift store shopping and bacon and tomato sandwiches. His strong willed nature showed through until his very last breaths. He was a fighter to the very end and held on as long as he could not wanting to leave behind his wife and Sarah and Ashley. We know that he is no longer suffering and will be watching over us with his daughter Lisa now. The family would like to thank all of the amazing care staff at Ponderosa Lodge and Gemstone Care Centre for making John’s stay comfortable and we know he appreciated all of you very much. We will be holding a graveside service for John on Friday October 21st at 11am at hillside cemetery. Sorry to hear of John’s passing, warm thoughts and hugs to you all.